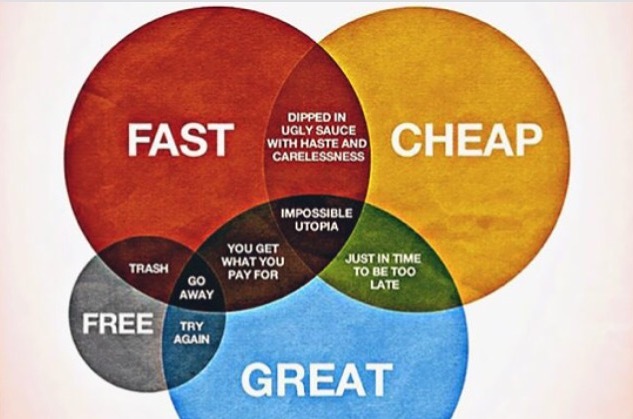 There's nothing more expensive than cheap design. The design world is changing and yet it strangely stays the same. In the mid 1990s the big debate was around free pitching. Clients asking designers to come to the pitch with the job already done. The design industry got together and rejected the practice. Some saw opportunity and were hungry enough to do the work despite the risk of getting nothing, but most saw the folly in it. Roll on 20 years and things have gone full-circle. We see an increase in online-based free-pitches. Designers free-pitching from a distance. The internet had democratised design. The internet enables a world-wide trade – that’s what it’s for. But design isn’t a commodity. It requires intuition, innovation, even philosophy. Its hard, nay impossible, to sell these skills at a distance in a price war. Whilst the design skills of the designers aren’t at question, these new “design sweatshops” mask a bigger issue with the way that design is bought and sold. Companies that use them often have very poor briefs, often don’t value design for what it can truly do for a business. We all know the stats: for every £ spent on design businesses can expect an extra £20 in revenues, £4 in increased profits and £5 in net exports (Design Council – Designing Demand). But this isn’t just moving a mouse or a pencil. It’s moving hearts and minds. It begins with getting under the skin of the client, challenging the brief, working out what is really needed (it’s rarely just a new identity), and delivering work that lifts the company and informs broader brand strategy so that it runs through the company like “Blackpool” through a stick of rock. Further more, auctioning the work results in tens of designs and this means that there is likely to be no real sense of direction or focus. In many ways the problem says so much more about the buyer than the seller. I question the value they put on design, I question the maturity of the company, I question its creativity and how seriously it wants to take itself. Buying design is not like buying electricity. You need a connection between the designer and the client; it’s an ongoing relationship, iterative and based on feedback, collaboration and, dare I say it, chemistry (some would say a little magic too). When you start-up times are tough and you need to keep costs low, but taking a gamble with brand may not be the best way to cut down. In the long-run, cheap design is more expensive than good design. Good design is invaluable and we aren’t saying that the designers offering these services aren’t good. But design has a process to it that is lost in this way of buying. It devalues design and disconnects client and designer. A designer should get to know their client, talk with them and meet them to understand the brand, motivations, and ambition. Understand their purpose. Many of these services promise unlimited revisions. Sounds good right? Really? Is tinkering going to make for a better solution? The aim surely, is not to need the revisions. To have understood the brief so completely that unlimited revisions are not required. It takes a whole career to work up your design processes, learning along the way. Each designer or agency will have their own, but it's that process that guides the work, pulls out the insights that shape it, identifies the trends that lead it. Some might think of it as another layer of cake that you have struggle through and pay for, so it's not needed, it's easier without it, “I just want a logo, how hard can that be?” A project’s success, big or small, is dependent upon its purpose, the way it communicates its difference, the process it went through. There's been many a project, campaign or logo design that has failed because of something as simple as one question not being asked. This approach to buying design ultimately devalues design; both financially and philosophically. A good idea is worth investing in, whether that's time or money. Sometimes it may seem that this kind of service will help, but a good, truly good, design that creatively captures the brief is worth the investment. So before deciding to open an account, writing your brief and pressing the "post" button, think whether you are going to get what you truly need? Are you going to feel that you own this, that it is aligned with who you are? Are the design team going to understand your purpose? Are they going to be able to communicate your purpose? Why gamble? There's nothing more expensive than the wrong thing. Buy right, buy once. Mark Shayler. Director of Ape; Founding Partner of the Do Lectures; Co-founder of Rebel Cell. Lloyd Bedford. Co-founder and Creative Director of Creativitea.